The Methven Kiri Satinjet Fixed Shower Head in Chrome and Graphite Kiri features clean lines and strong, dynamic forms. 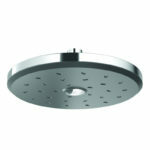 The fixed shower head combines style with best shower experience and great eco-friendly water efficiency. The high-pressure shower head features Satinjet technology and is fitted with flow restrictors. Colliding twin jets produce over 300,000 droplets of water per second for the ultimate shower experience and the advanced shower system saves water and saves you money. Easy DIY installation - no need for a plumber. Award-winning Methven collections blend smart water engineering and world-leading technology with beautiful design.